Panevezys Lietkabelis (LKL) added to their roster 23-year old Nigerian international guard Ike Iroegbu (188-86kg-95, college: Washington State). 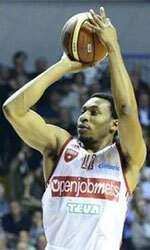 He started the season at Science City Jena in German BBL league. In 10 games he had 11.1ppg, 3.0rpg and 2.3apg this season. The list of the past achievements is quite long as among others Iroegbu was voted Afrobasket.com All-Afrobasket Championships 1st Team in 2017 at his college time. Iroegbu also represented Nigeria at the Afrobasket Championships two years ago. His team won Silver and his stats at that event were 6 games: 14.8ppg, 4.5rpg, Assists-1 (5.0apg), FGP: 50.0%, 3PT: 20.8%, FT: 74.3%. Iroegbu has played previously professionally in NBA (Sacramento Kings) and NBA G League (Agua Caliente Clippers of Ontario). He attended Washington State until 2017 and it is his second season as a professional player.